The Prison Officers' Association blamed the rise on a lack of staff, increasing violence, drugs, access to mobile phones and overcrowding. Neil Samworth, a former prison officer at HMP Manchester, said: "It's horrendous now - assaults have gone through the roof." "Staff are regularly potted [have faeces and urine thrown at them] and it's the level of assaults. "There aren't enough officers to get people out of their cells so the prisoners are bored, they take drugs and that leads to violence and bullying. "I've been assaulted before - I had a prisoner try and strangle me, I've been kicked, spat at. It causes anger and frustration among officers." Image caption Former prison officer Neil Samworth says assaults have "gone through the roof"
Lowdham Grange prison in Nottinghamshire saw the biggest rise over the last four years - 35 call-outs in 2018 compared to seven in 2014. The Prison Officers' Association, the union for prison staff, said it was "not surprised" by the figures. 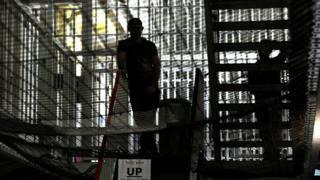 "It shows a multitude of problems in our prisons, including lack of staff, increasing violence, drug problems, access to mobile phones and overcrowding," it said. Additional figures obtained by 5 Live showed the Tornado team was called out eight times in 2018 - a decrease on 2017 (23 times), and 2016 (16 times). The POA said Tornado call-outs had dropped because local prison staff were rapidly dealing with "concerted indiscipline" - which involves two or more prisoners - before it escalated. The Ministry of Justice said the NTRG and Tornado "provide additional support staff or resources to prisons to help them deal with a variety of incidents". "The overwhelming majority of call outs are for non-violent incidents, including where they attended as a precaution and when the situation was resolved by prison staff," it said.